Pre-construction. To be built. Over 45% reserve! Ground breaking estimated 1st quarter of 2018. From the Developer of The Ritz-Carlton Sarasota and Concession Golf Club and Residences, we proudly introduce BLVD Sarasota. Become a resident in one of only 49 expansive and innovative modern residences in Sarasota’s newest, most impressive downtown address. You glance out the window at your vibrant city with all its cultural offerings, trendy restaurants and boutiques, wondering what excitement today will bring. Then, you see the Bay, simply breathtaking. Add on-site dining on the first floor and Sarasota's only private rooftop pool – there’s nowhere else like it. With 2 floors of planned amenities including an 18th floor roof deck with resort style, zero horizon pool, outdoor kitchen and lounge area, and multiple gas fire-pits overlooking the Bay, downtown and incredible views of Siesta, Lido and Longboat Keys. A leading edge indoor driving range, climate controlled private wine cellar and lounge, a pet grooming salon, and pet lawn are just a few other amenities unique only to BLVD. 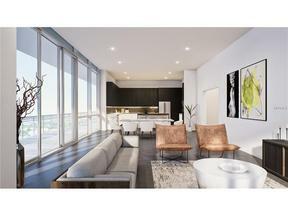 With 4 different floor plans ranging in size from 3550-3900 sqft, these luxury units provide the size of a single family home with the 24/7 concierge convenience of condominium living. Natural gas now available to the residences. 2 assigned parking spaces convey with each unit. Limited time pre-construction pricing.